These rainbow chocolate-covered cookies are fast, easy, and adorable! Dunk an Oreo—or any other round cookie—in white chocolate, then decorate the top with mini M&Ms and white sprinkles in the shape of a rainbow and clouds. You could even add gold sprinkles or a gold Sixlet to represent the pot of gold at the end of the rainbow! These cookies are perfect for St. Patrick's Day, or any party. They're pretty sturdy, so they make great edible favors too. Place 16 ounces white candy coating in a medium microwave-safe bowl. Microwave in 30-second increments, stirring after every 30 seconds to prevent overheating, until the coating is melted and smooth. Using forks or dipping tools, dip a cookie in the coating until it's covered completely. Remove it from the coating and let the excess drip back into the bowl, then place it onto a baking sheet lined with parchment or waxed paper. After you have dipped 4 to 5 cookies, pause and decorate the tops before the coating on the cookies hardens. 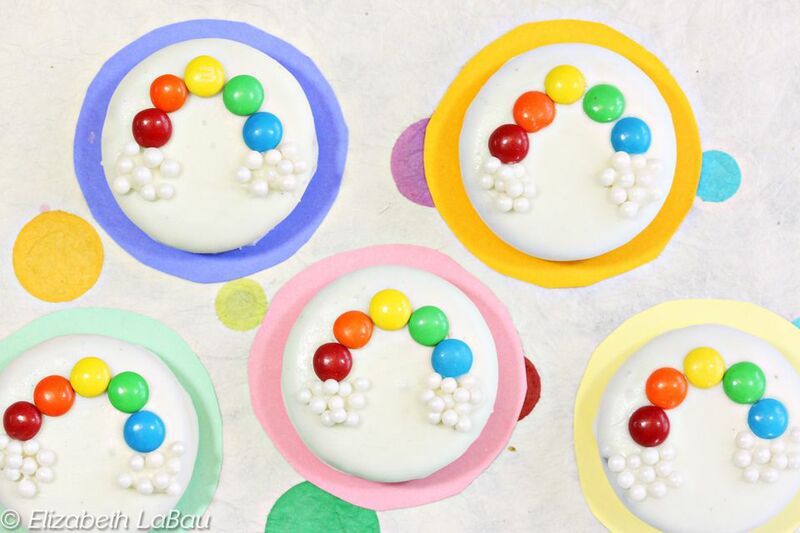 Take 5 mini M&Ms in assorted colors and arrange them in a rainbow shape on top of each cookie. Add a pinch of white pearl sprinkles below the bottom edges of the rainbow on each cookie. Repeat the dipping and decorating process until all of the cookies are finished. Refrigerate the tray briefly to set the chocolate, for about 15 to 20 minutes. Once set, the cookies can be served immediately. These also keep well, so you can store the cookies in an airtight container at cool room temperature for up to a month.